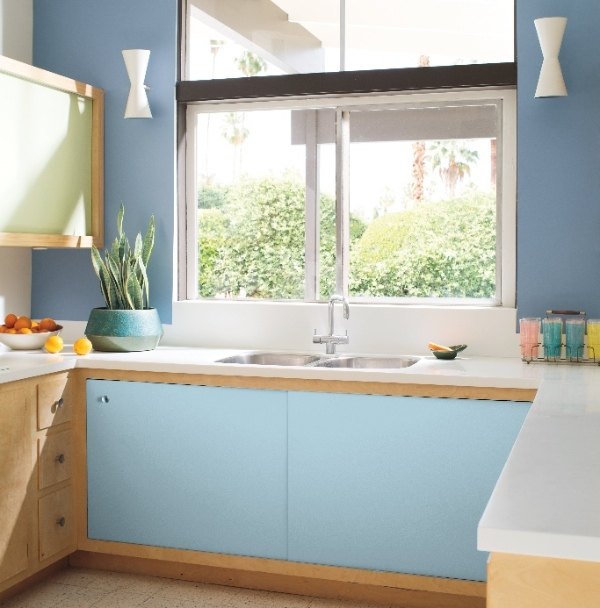 Whether you're planning to repaint walls, cabinets or have a whole kitchen remodel, introducing colour into your kitchen is a powerful way to modernise a tired looking space. So today, we are hoping to inspire you with some stunning kitchens, each featuring a different idea of how to create impact and individuality in the heart of your home. 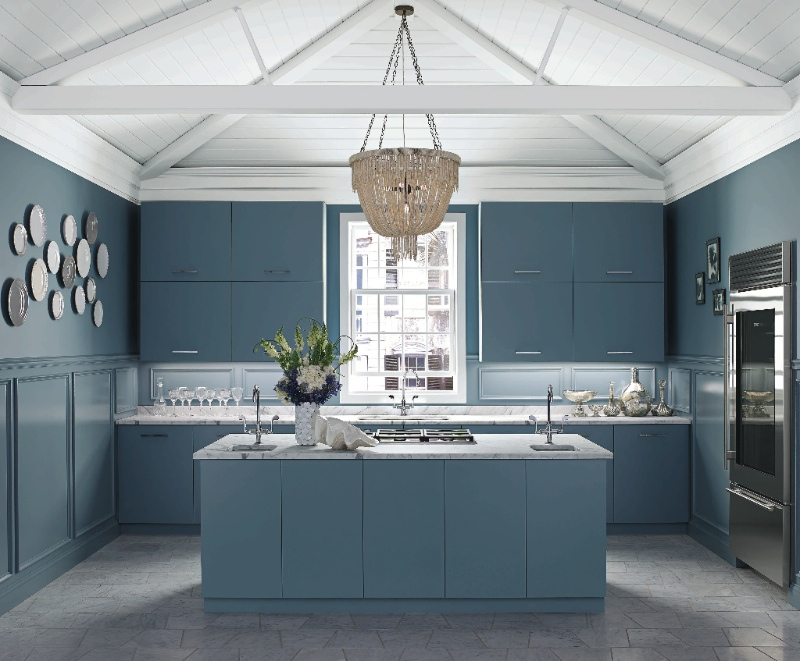 For the ultimate wow factor, consider painting your cabinets and walls in the same colour to create a statement scheme. We often see contrasting colours used to highlight a central island unit, but it doesn't have to mean using a dark colour. 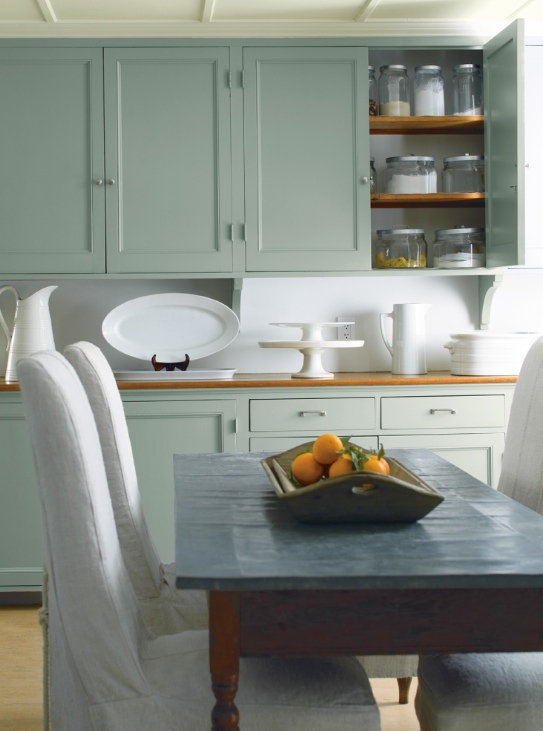 Here a soft, mid-tone green is used with warm white cabinets. To help you to decide what type of colour scheme would best suit your space, the first thing to consider is what you would like the eye to be drawn to. The level of contrast you choose to have between your walls, cabinets, counter tops and an island unit will accentuate different features. If you would like an island unit to really stand out, then opt for a contrasting colour to the rest of your scheme for your island cabinets. If you would like to make a feature of your worktops, consider using the same colour, or two tones of the same shade, on the walls and cabinets, which will ensure your works surface really stands out. If you'd like to add a bit of depth through a darker colour on the cabinets, but are concerned it might be a little bold, consider painting your lower cabinets in a darker shade and the upper cabinets in a lighter version of the same colour - this is a really stylish and effective way to bring some character into your scheme. 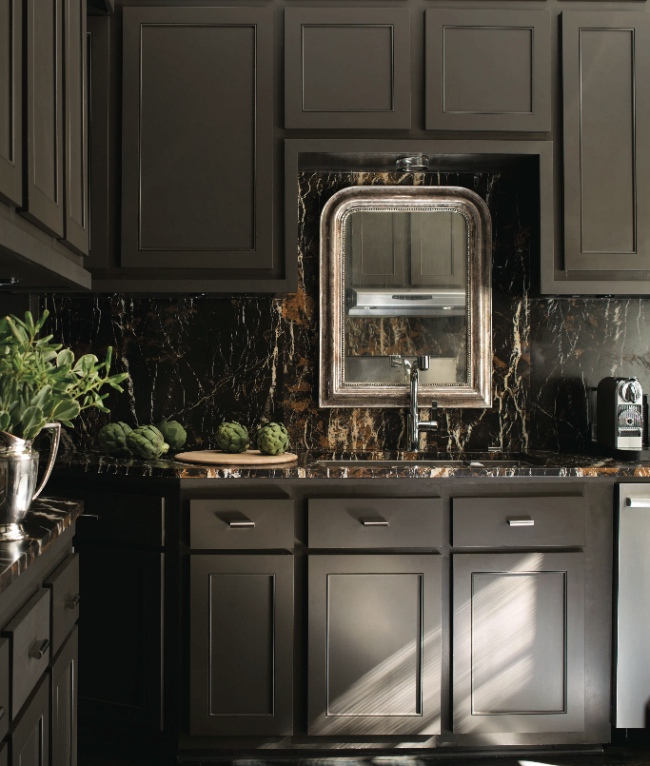 This stunning marble splash-back is cleverly highlighted by the dark chocolate brown on the cabinets. Cabinets - Char Brown 2137-20. Here a pale, muted pink tone is used on the ceiling, rather than a stark white, to soften the overall feel and bring out the undertones of the wooden cabinets. Wall - Silver Fox 2109-50, Ceiling - Pink Damask OC-72. When it comes to choosing specific colours for your kitchen, as with any room, its important to consider any items that are not being changed, such as flooring, work surfaces or even favourite accessories. Daylight and artificial light play an important role in the appearance of any colour, so be sure to study how the colours look and feel in your space at different times of the day. Finally, kitchens are often spaces that need to flow with the colour schemes in adjacent rooms. If you are interested in learning more about Colour Flow, take a look at this article. 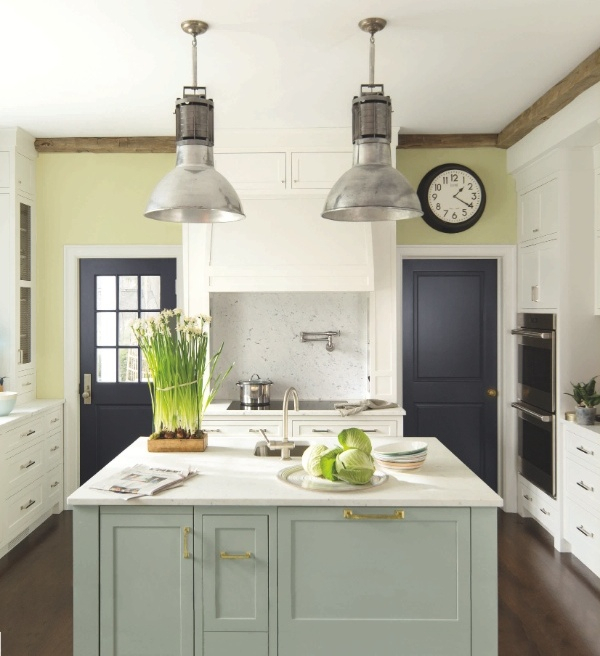 This kitchen is given a modern feel by painting select cabinet doors in tonal shades. 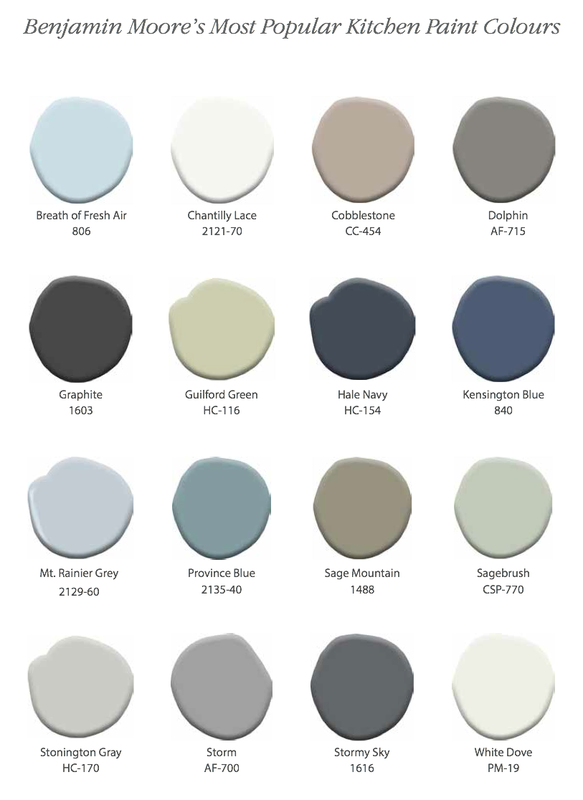 As for the best paints to choose for a kitchen project, most homeowners select a washable and stain resistant paint for the walls, such as our Regal Select Matte. For the cabinets, we recommend our Advance Water-based Alkyd paint, which is exceptionally hard wearing and tough, but, being water-based, does not have a strong odour during application and drying. Advance is available in Satin and High Gloss sheens, with a Matte sheen level coming soon. 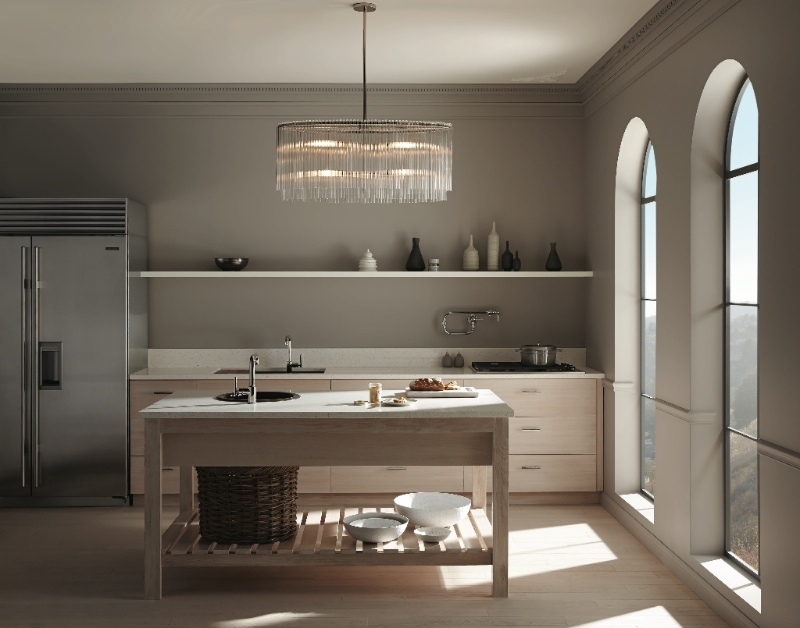 For more inspiration visit our Pinterest Kitchens board or our Instagram page.